Italian painter; born in Ferrara 1811; died in Venice Jan. 26, 1856. He was descended from an old and distinguished family. As a boy he evinced a predilection for music and painting, and studied art without having any particular career in view. Orphaned at an early age, he was forced by circumstances to choose a profession. He followed the style of Canaletto, the Venetian landscape and architectural painter. His picture, "The Façade of the Cathedral in Ferrara," was exhibited in 1840 in Venice, and won for him considerable approbation. In 1841 his native city, Ferrara, awarded him a silver medal in appreciation of his labor for art. To perfect himself in his art he went to Rome in 1843, and won the friendship of Massimo d'Azeglio, the painter, statesman, and author. Returning to Ferrara, he received many important commissions, one being from the Duke of Brunswick. In 1850 he removed to Venice, and was one of the first to practise artistic photography. His views of Venice were awarded a medal at the Paris Exposition of 1855. In Ferrara, Coen enjoyed extraordinary popularity, his house being a literary and artistic center. 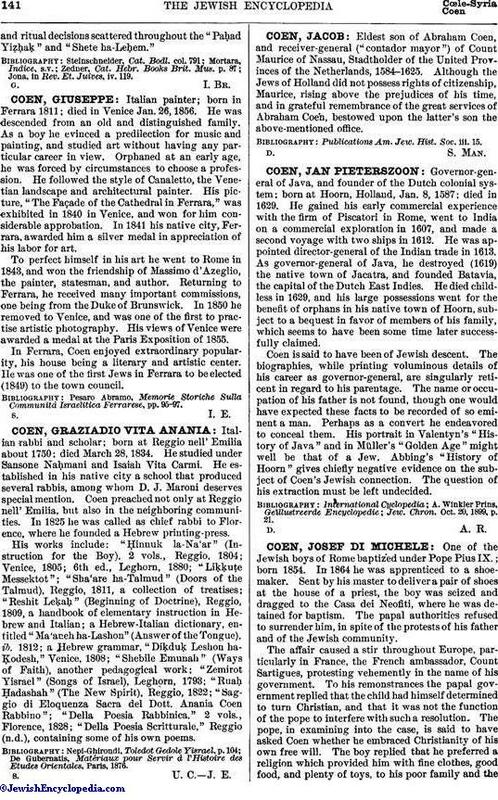 He was one of the first Jews in Ferrara to be elected (1849) to the town council. Pesaro Abramo, Memorie Storiche Sulla Communà Israelitica Ferrarese, pp. 95-97.